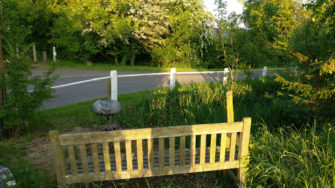 The second place I visited was Church Lane (the first being Salmon’s Lane), and only a short way off of the main A120 Coggeshall Road I found the modest St. James the Less Church, with a small pond and convenient bench not far away. It was a lovely spot so I spent twenty minutes or so soaking up the ambience. A fella and his dog both came to investigate me, with the man telling me that buzzards and roe deer are a common sight here but that the cuckoos haven’t been heard for a few years. The dog gave the mic a good sniff and my hand a lick. With the setting sun behind me and the black bird, wood pigeons and coots I certainly enjoyed the fading warmth of the day in a peaceful location, whilst contemplating what may be about to transform the place.